Rapid, efficient die change has been a boon to metalformers as part runs become shorter and part numbers grow. The ability to slash time from last part to first part keeps presses running and productivity soaring. Standard systems, for standard press-line layouts and standard applications, are perfect candidates for quick-die-change systems. But what about the nonstandard? Are you holding back on implementing or expanding this technology due to your unique production situation? Then it’s time for a reboot. Technology and knowhow exists for crafting systems and components that replace dies quickly, accurately and safely. Either way, custom or standard, suppliers have answers for metalformers’ QDC needs. See below for a few solutions, and look for more in future issues of MetalForming. Air Glide heavy-duty pneumatic die lifters from Pacesetter Systems, Inc., Valencia, CA, are available with ball bearings for multidirectional movement or cylindrical bearings for inline movement. The die lifters require only 40 lb. of force to move a typical 2,000-lb. die, according to company officials, reducing strain on employees while also reducing die-changeout time. The lifters use standard shop air pressure and install easily in standard ANSI T-slots. With no internal air bags or bladders to corrode and crack, Air Glide rollers reportedly are more resistant than other pneumatic rollers to harsh chemicals and lubricants used in metalforming. The lifters feature extra-large, precision-ground bearings and high-quality o-ring seals for lifting efficiency and durability. They are available from stock in sizes of 5⁄8, 3⁄4 and 1 in., in lengths to 72 in. Custom lengths and metric sizes are available. Big dies require added muscle to ensure safe, accurate and efficient transfer. The Titan 3117, from Green Valley Manufacturing, Inc., Mount Zion, IL, is a 30,000-lb.-capacity die cart featuring a DC-powered drive, lift, transfer and docking latch. It offers two-wheel drive and two-wheel steer, and has a low-friction roller deck. When coupled with the Titan 3118 storage rack and the Titan 3120 die splitter, it forms a complete integrated die-handling system. Hilma Div. of Carr Lane Roemheld Mfg. Co., Fenton, MO, offers smooth die movement into and out of presses, via its hydraulic roller bars. Used in pairs or sets, they lift the die and provide a roller surface to easily roll the die in place during the die-change process. For use in standard 11⁄16-in. 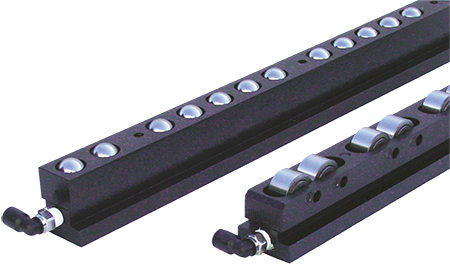 or ASA T-slots, the bar’s hydraulically operated supporting rollers allow simple movement in line with the bar. The rollers, available in four sizes, can be positioned for front-to-back or left-to-right movement. Maximum operating pressure is 1740 psi. With inhouse engineering expertise, Serapid, Sterling Heights, MI, has the ability to design solutions for nearly any load-transfer application, according to company officials. The company makes use of rigid-chain technology, employing electromechanical lift power as an alternative to hydraulics. The environmentally friendly technology (no hydraulic oil) has been used for lifts to 300 tons, while reportedly using less power and energy when compared to hydraulics. The addition of regenerative drives offers the possibility for even greater energy savings. The company offers three types of die carts (all customizable) that run on rails embedded in the floor of a facility, a safe system that allows for accurate, repeatable positioning. Also offered: custom-engineered domino-style die-change systems, ideal for serving an entire line of automated presses. Such a system first brings die carts carrying new dies into position in front of their respective presses, with one empty cart to the rear of the last press. Carts and press bolsters are then aligned, and new dies are pushed into their presses, with the old dies pushed onto the carts on the rear of these presses, in a domino effect. The carts move back again and bring the old dies to storage. This operation is controlled manually by the operator, with a pendant device. Included in its QDC portfolio, PFA Inc., Germantown, WI, offers high-pressure hydraulic control units, powered with commonly available air pressure and made in a variety of configurations to optimize all QDC applications. For example, locking clamps are hydraulically actuated and then mechanically locked during press operations. They must be re-pressurized in order for the mechanical locks to be released. A hydraulic pressure booster button makes unlocking a simple process. Also, hydraulic die-lifter rails provide exceptional lift capacity, but must be lowered prior to clamping. The addition of a hydraulic pressure-relief valve helps protect the rails in the event that dies are clamped before rails are lowered. Pre-rollers simplify the process of pulling out and pushing in dies, allowing the use of a forklift or crane to remove and load the die while minimizing the risk of damage to the dies or the press. Mounted as a set, pre-rollers from EAS Mold & Die Change System Inc., Menomonee Falls, WI, are equipped with hardened-steel-surface needle roller bearings to offer a high load capacity, and are available for varying die weights and sizes. Die stoppers at the end of the pre-roller prevent the die from rolling off while allowing simple loading of the die onto the pre-rollers. With mounting blocks added, the pre-rollers can be used on several presses. Fixed pre-rollers from EAS offer greater lengths and higher load capacities, and these units can be moved, such as into storage, via adjustable supports. Pre-rollers also can include swivels to turn the units away from the front of the press, or they can be motorized, thus serving as economical alternatives to die-change tables. The patented Tee-Lift pneumatic die-lifting system from Wardcraft Conveyor, Spring Arbor, MI, can work with dies weighting to 20 tons. Comprised of steel rails custom-designed to fit into specific applications, the system includes spun polyester/TPU-lined air bags positioned below the rails in designated T-slots. When shop air is injected into the air bags, the rails are pneumatically lifted to the shoulder stop in the T-slots. Crowned rollers, set into the rails, are subsequently raised 1⁄8 in. above the bolster surface, lifting the die in the process. When the original die is removed and a new die is positioned on the Tee-Lift, the air is released, bringing the rollers and rails below the bolster surface and leaving the die securely in place. The weight of a die will determine whether the die can be positioned manually or if mechanical assistance is required for loading/unloading.